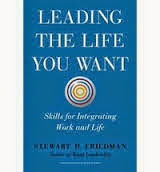 This is an excerpt from the new book "Leading the Life You Want: Skills for Integrating Work and Life," by Stewart Friedman of the University of Pennsylvania Wharton School. It's a very useful example of how one person has created a life habit of journaling - and of reviewing the journal regularly to assess progress and plan for the future. It's still dark outside when Tom Tierney rises in his home outside Boston on a December morning. He dresses quietly, so as not to wake his wife, Karen, and goes to the kitchen to brew some coffee. At fifty-nine, Tierney is trim and retains a certain boyishness, helped by the rimless glasses, a full head of hair, and boundless energy. He carries a mug and the fresh pot into his office and closes the door. It's 5:15 a.m., and time to begin the ritual of writing what he calls his "annual review." The term reflects Tierney's lifetime in business: the Harvard MBA, two decades at the consulting firm Bain & Cimpany (including eight years as chief executive), and fourteen years as cofounder and guiding spirit of the nonprofit Bridgespan. But he doesn't write this personal document with the notion that it should be legible for anybody else. "It's just for me," he told me in a long interview a few years ago. "I ask how I spent my time. And I ask how I'm doing. And then I ask, 'Where am I going with all this? How can I be better? What are my priorities for the next year? Five years? Ten years?'" The annual review is more than a career assessment; it might include personal goals or thoughts about how his two sons are doing. The ritual reflects the qualities that Tierney is known for: discipline, self-reflection, an ability to think big and creatively, and a dedication to personal development, his own and others'. As he works, he goes back through journal entries that he's written on cross-country flights and in other spare moments. Tierney, who has been journaling for decades, believes the practice helps him record meaningful data. "I keep track of every single travel day, of every day that I'm home after seven, and of how many nights I'm away and what's causing that." But it also helps him think through bigger life questions, track his progress toward long-term goals, and capture ideas and dreams about what might be.